8 Inspirational Places to Visit in Rome! Rome, Italy – the Eternal City! Want to be truly inspired when you explore Rome? Then find the most inspirational sights to visit! Find below 8 famous places to get you started! Marvel in the enormity of this historic place and be watched by all the splendid statues that surround St Peters Square. Witness the amazing St Peter’s Basilica, the heart of the Catholic Church, and let it take your breath away. Admire Michelangelo’s magnificent frescoed ceiling in the Sistine Chapel. Hear tales of the glory of ancient Rome! Visit the Colosseum and overlook the Forum while in Rome! You may even catch a firework display if you’re lucky! Take a stroll through Piazza Navona featuring the famous Fountain of the Four Rivers. Meet Trevi Fountain, one of the most famous fountains in the world which has starred in many films including the famous La Dolce Vita. Take time to admire the magnificent Pantheon, one of the best preserved Roman buildings to date with an abundance of fascinating historical facts. Relax around the mighty Spanish Steps and then go exploring the widest staircase in Europe! Whether thought to be part of an ancient Roman fountain or even a man hole cover, the Mouth of Truth has continued to fascinate and was even famously portrayed in the film Roman holiday. Contiki Holidays – an excellent choice for young adventure seekers! Do you seek adventure and have a hankering for all things British? Want to explore the amazing sights and sounds of England, Scotland and Wales? Does the thought of Ireland make you want to leave everything and go there now? Well look no further as Contiki tours has one of the widest choices available, from quick breaks to epic journeys, Contiki trips cover the world from all angles for 18-35 year old adventure seekers! From Contiki tours Europe to Contiki tours UK, you cannot fail to find something especially for you. Contiki tours UK combines the most picturesque countries in Europe – England, Wales, Scotland and Ireland. From short and date specific tours such as ‘St. Patrick’s Day (Ends in London)’ 4 day tour to more extensive tours such as their ‘Great Britain & Ireland (Ends in London)’ 16 day tour, Contiki holidays has the adventure you are looking for. Contiki tours also offer an amazing ‘England & Scotland’ 9 day tour which can either end in Glasgow or London. This tour has the lot and includes a whirlwind of sightseeing, amazing medieval history & culture , and of course legends – watch out for the Loch Ness monster. What’s more, although there are some cheap places to stay in the UK, Contiki trips also offer a way of extending your stay with their ‘London Explorer (2 nights) (Imperial Hotel, Ends in London)’ short tour. It’s more like a self-guided package which you can add onto your other Contiki holidays. Having said that, there are Contiki tours UK Representatives in central London on hand to help you out with sightseeing info and tips on getting around. There are also plenty of day trips from London to choose from if you want to go further afield. You can book a Contiki tour plus all Contiki tours Europe with BIG SAVINGS all year round. Book with Global Coach Tours and they will give you an extra 8% DISCOUNT off most Contiki tour prices listed on their website that are 8 days or longer. This is additional to other Contiki savings, including group savings when 4 or more friends book together and last minute deals – wow! Book a Contiki holiday for the most amazing experience of your life and the best holiday deal to match!! Prince Philip need not worry. My wife Sue and I celebrated our 13th wedding anniversary with a two night short break aboard the Cunard ship Queen Elizabeth. It is one of Cunard’s most recent and elegant ships with traditional accents. Setting sail from Southampton we were reminded of our last Cunard cruise in 2009 when we crossed the Atlantic to the USA and Canada for a five month extended visit. That time we were accompanied by our labradoodle Coco. You can see her on board the Queen Mary in this short clip. Our voyage this time took us eastwards to the port of Zeebrugge. We took the courtesy shuttles to the Belgian seaside town of Blankenberge. There we found markets selling large sausages, cafes with green straw frogs and chocolate shops galore. There were shoe shops where multi coloured shoes seem to be the current fashion flavour. The seafront and beach was well tendered, lined with cafes and restaurants. We were very tempted to explore more of this part of Europe. You can only see a little part of the coastal areas when on an ocean cruise, whereas on a coach tour you would see much more of the interior. A suitable tour might be Best of Holland Belgium and Luxembourg by Trafalgar Tours or Country Roads of Belgium Luxembourg & the Netherlands with Insight Vacations. On these tours you go to the heart of many towns as an overnight guest. A visit to the town of Bruges is included in coach tours, whereas as cruise ship guest may pay at least £80 per person for a guided day shore excursion. If you would like to book a cruise aboard this or any other Cunard ship or of course a coach tour, please get in touch with us. Another cruise ship in Southampton – can you name it? Explore romantic Ireland as a Valentine’s Day treat! I’d been trying to think of romantic destinations to visit as a Valentine’s Day present for my hubby Rick as he had been working hard all year and could really do with a treat. It wouldn’t have to be a trip on the actual day but just something to present to him as a gift for a future date. I’d pondered on the usual Paris and Venice trips but wanted to find something a little bit more different, something that my ‘adventure seeking’ and ‘inquisitive’ hubby would appreciate. 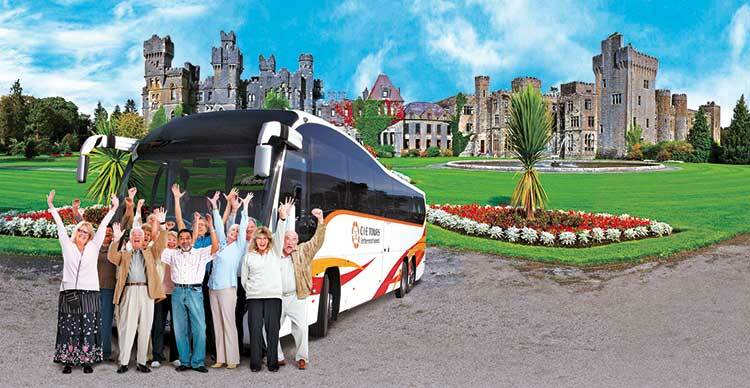 Eventually, I came across some tours of Ireland organised by CIE Tours which looked extremely tempting. 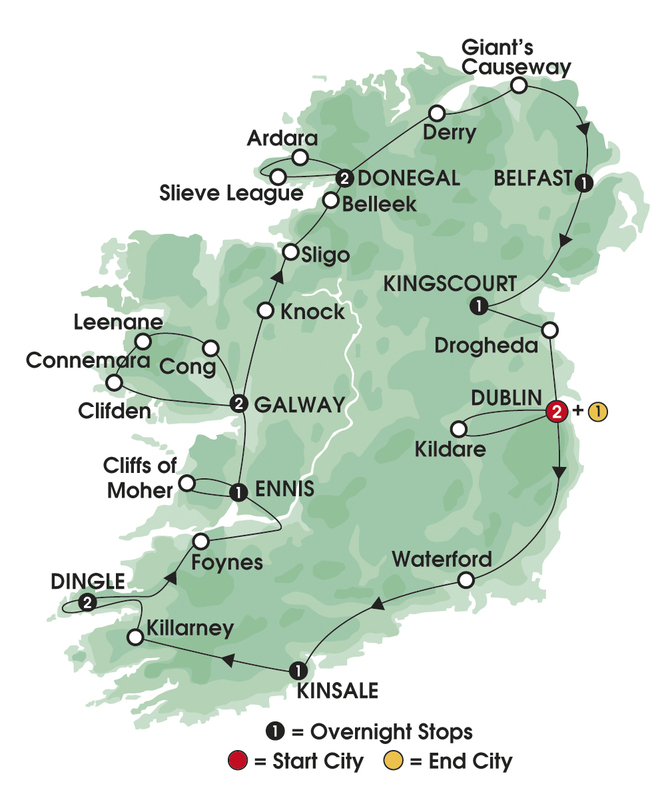 As I wanted it to be quite a long trip, I chose the ‘Jewels of Ireland’ tour which lasts 14 days and ticked many of the boxes I thought Rick might like. It also had the added bonus of having 5% off which is always a winner in my eyes. As you can see on the map, the amount of places you visit are extensive but with just the right amount of travelling in between. I also liked this CIE tour because there are no hidden costs, or in other words, no optional extras to purchase once you get there which saves a lot of hassle as far as I’m concerned. Below are some places that I’m looking forward to visiting – Giant’s Causeway, Cabra Castle and hopefully some lively Irish music and dancing! There are also trips to Cong village, where “The Quiet Man” movie was made in 1952, and Belfast to see Victorian buildings and the shipyards where RMS Titanic was built in 1912. 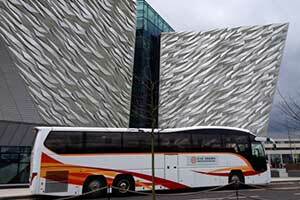 There is also a visit to Titanic Belfast, a state-of-the-art museum with amazing displays – Rick will absolutely love this. The Hotels are absolutely gorgeous as well and are superior first class. Impressed? I was and cannot wait to go, the sooner the better. I’m hoping by the end of it, we will be looking like this lot below! 10 things to do and see in Paris on Valentines Day! FRANCE’S GLITTERING CAPITAL! SEE WHAT YOU CAN DO IN THIS MOST ROMANTIC OF CITIES ON VALENTINES DAY! Visit Paris by night in an open-top bus, discover the main monuments of Paris illuminated and listen to a commentary about the history of Paris. Have an entertaining evening in the Bohemian Montmartre area. Stroll by the Place du Tertre, famous for the artists painting outdoors, have an enjoyable dinner in a typical restaurant with musical atmosphere. The Louvre – the biggest and best known museum in the world was once the palace of kings. Follow the sumptuous maze of galleries to see the main attractions including Venus de Milo, Leonardo da Vinci’s masterpiece – the ‘Mona Lisa‘, and the State Apartments decorated in the style of Emperor Napoleon III. Spend an evening at the Moulin Rouge cabaret. Dine from the “Mistinguette” menu, and watch the famous “Feerie” show with Champagne. Visit a typical French cafe and simply relax as you watch the world go by. Enjoy your delicious lunch served with a wine or two. Experience the sheer joy and excitement that is Disneyland Paris! Don’t miss the majestic Notre Dame Cathedral which is particularly a feast for the eyes at Christmas time. See the wonderfully imposing Eiffel Tower – a truly magnificent sight! Take a walk down one of the most famous streets in the world, the The Avenue des Champs-Élysées. With its luxury shops, cafés full of delicious food, cinemas and beautifully styled horse-chestnut trees, there is no better way to spend an afternoon. At the western end of the Champs-Élysées, you will find the world famous monument, the Arc de Triomphe to feast your eyes on and explore.